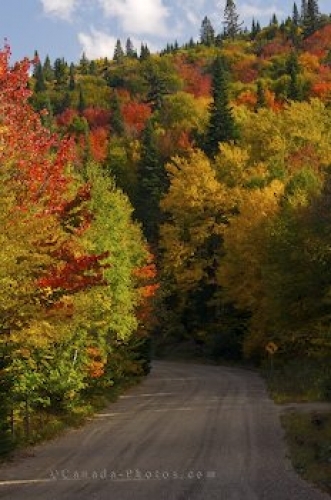 A gravel road through Parc national du Mont Tremblant, the largest Provincial Park in Quebec, is a beautiful scenic drive when the colours of Fall appear. The Fall colours along Highway 2 decorate either side of the gravel road which winds through Parc national du Mont Tremblant in Quebec, Canada. Parc national du Mont Tremblant is the largest Provincial Park in Quebec with an endless list of activities and discoveries to partake in all year round. Summer offers hiking, fishing canoeing, kayaking, swimming, camping, while winter brings out the skiers who enjoy the snow covered slopes of the Laurentides mountain range. Fall is one of the prettiest times of year as the trees explode in vibrant colours from about the middle of September until the middle of October. Fall Colours along Highway 2 through Parc national du Mont Tremblant, a Provincial Park of Quebec, Laurentides, Quebec, Canada. Picture of the fall colours along the gravel road in a Provincial Park in Quebec, Canada.